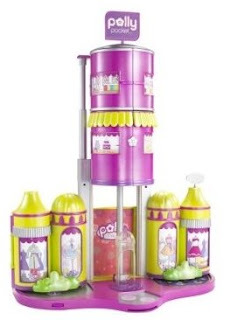 Today's giveaway is the Polly Pocket (fabtastic) Mega Mall Playset!! Can I confess? I was tempted to crack into this thing and check it out for myself. How stinkin' cool does this thing look? Polly Pocket has been a long-time "fave" of little misses everywhere. This Mega Mall will only take their imaginary play to the next level. Yup, This mall has 3 LEVELS! It's the "Mall of America" for Polly Pocket. Forget the mad dash to the mall this holiday season and instead bring the mall home with the Polly Pocket™ Mega Mall Playset. 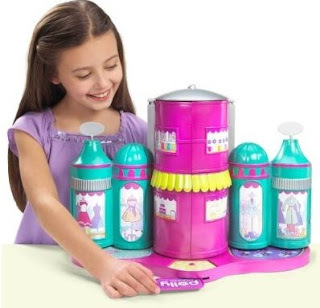 For any young mall aficionado, this new playset allows girls to discover an ultimate shopping destination complete with magical transformation and lots of totally stylin’ new fashions and accessories for Polly™ and friends. Girls can swipe the credit card which opens up the Mega Mall Playset to reveal three levels of fab stores (including a skating rink, ski shop, pet store and candy shop) for hours of play! The Mega Mall Playset also includes a Polly™ doll and two adorable pets. This is appropriate for little ladies ages 4+ and retails for $49.99. Want to win? Please see the official rules and leave your comment below to enter. My daughter would be thrilled to get this for Christmas!! wow! They did NOT have stuff like this when I was a little girl! Very cool, my niece would LOVE this, my little girl is a bit to young yet! How cool is that? What an awesome giveaway. It would definitely make one little girl I know very happy on Chrismas Day. Wow, that's huge! Thanks for the chance and yeah I'd be playing with this too! I've go the button up... that would make a great x-mas gift. Wow my bear would love this. She's really into polly pocket. I'm doing another blog about 12 days of christmas today. This is just such a fabulous blog. Oh, it's Polly Pocket Shopping heaven. My girls would squeal with delight if they were to open this on Christmas morning. Your giveaway rocks, thank you. So cool!!! Love the mall! My daughter would be so excited to receive this for Christmas!! Thanks for the entry! My daughter would seriously love this! She is always talking about playing polly at daycare but we have yet to get any at home. It's soo cute, I might just sneak in a little play time too! - I added your button. Wow this is cool. My sister would love it even though she may be on the verge of being too old for polly pockets, my little one is too small for the pieces but I definitely know some friends daughter's who would love this toy. Please enter me Amy. PS Yeah it's a mom thing about our kids being cute, smart, etc. It just makes you feel good. All that we were told to get my soon to be niece for Christmas was Polly Pocket stuff and Bratz dolls. I don't do bratz dolls...so this would be such a great thing to give her this year! And have the button up on that page as well =) Thanks! So neat! I wish they had stuff like this when I was a kid! This is so much fun...I think my niece would LOVE this gift. Im a follower now as well! My daughter would be in heaven if this was under the tree! And it comes with its own credit card? LOL- I want it. Please enter me into this contest. Already blogged and added badge. My four year old would love this! Enter me in for this one, too! Thank you! Wow, I LOVE your giveaways!! You rock Amy!! I'm a subscriber through google. My daughter would go nuts for this! our niece would love this!! This would be a great gift for my niece. I'm scared of all the polly pieces being strewn throughout the house but maybe they will all stay together. I hope. My great niece would like this for Christmas. Please include me. what a "girlie-girl" gift for my special girl!! i would love to play with it, too - you are right! I have 3 daughters that would love this!! I know someone who would totally lose their mind over this! My nieces would love this one! Count me in sister! I posted you on my blog for others to join in. I want one. (It's for my daughter I swear) lol. WOW, I could see my daughter and I having lots of fun playing with this. How fun. You have some great giveaways these 12 days. Thank you!! I'm a subscriber and loving it. Your button is right there on my front page!! This would make a perfect christmas present for my niece!! Geez Polly Pocket isnt exactly pocket sized anymore is she? lol My neice would LOVE this though! Sissy would love to get this for our Elle & Stacy Polly Pocket Movies. It would be awesome! can't remember if i already entered, but i subscribe, so count me in!! what a cute a giveaway.. Thank you for these wonderful giveaways.. thank you to the sponsors as well.